The newest cleaning games in 2016 . Clean up messy room and wash laundry games ! 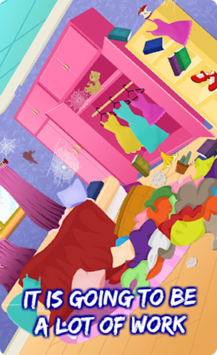 We are happy to present you one of our cleaning games, called Messy House Bedroom Cleaning, which is an usual clean up game for girls, because you must clean up messy room, but also wash laundry in the same house cleaning game . Sounds to be nice, isn't it ? So, let's see what is your job in this kind of messy house cleaning games . First level will give you to clean up messy room . A very, very messy room, where the clothes are everywhere, the book are on the floor, the toys are on the bed and the shoes are in the wrong place ! There is a lot of work to do before cleaning this messy room ! Put each object in the right place or fix the broken stuff before cleaning the dirty walls and windows. After you finish with room cleaning, you have something else to do : wash laundry that you have from first level . So, go to the laundry room , where you have a virtual washing machine, separate the white clothes from the colored clothes and start laundry ! Be sure that you will use the correct detergent for each kind of clothes ! 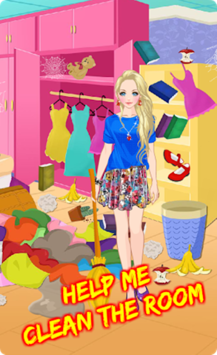 We hope that you will like our house cleaning games and will rate it or write your opinion about this clean up messy room game ! Enjoy playing !